In case you haven't heard, today is International Yoga Day. Celebrations take place worldwide and you can bet that there'll be a fair number of people having their first introduction to this life-changing practice, while others will be opened up the idea of teaching. It seems strange to me now, but just a few yeas ago I’d never considered becoming a yoga teacher. In fact, I’d never even considered how anyone might become a yoga teacher. I knew I loved the practice, but it never occurred to me that it could become a career choice. There was no International Day of Yoga back then (pre-2015). In fact, I did the training as a challenge to myself, to see if I could. It was only in the last week of the course that I thought ‘I want to do this’, and it’s ended up being the most fulfilling job I’ve ever had. Even having a top 5 bestselling novel didn’t do what teaching does, in every single class. Yoga is such an incredible way of wandering through our time on this planet and there’s so much to learn that it would take at least one lifetime to master. 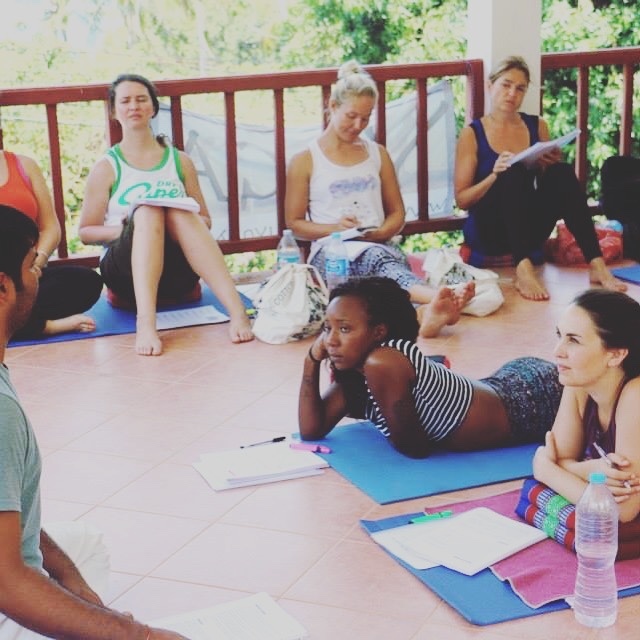 In the last few weeks, I’ve had a few conversations with different people considering taking a teacher training course and since its International Yoga Day, I thought I’d share them with you. This first part will give you an idea on what to expect from a teacher training course, and the second will go into things to consider when looking for a school to learn from. If you’re interested in becoming a yoga teacher, chances are, you’re already aware that it goes much further than stretching on your mat. I’d been practicing for years before I did my course with Ashtak Yoga School. There I learned that yoga extends way past the practice of asanas. Get ready to learn about how it interlinks with Ayurveda, philosophy and even physics. And to have your mind blown! If you’re someone who likes to repeatedly hit the snooze button and sleep in until midday, then you might want to start practicing waking up early. If you’re doing an intensive course, your days will likely be packed from start to finish. On both of my courses, we started at 5:30am, six days a week. That meant waking up at around 5am for a snooze, quick shower and toothbrushing before heading to the shala to be ready to start in time. Sound like hell? Wait until you’ve watched the sunrise during pranayama class, or listened to the complete silence around you before the world wakes up. It’s worth it, I promise. Nothing worth doing in life is easy. Fact. And I won’t lie, a teacher training can be rough. We rarely get an extended chunk of time to be with ourselves, to clean our bodies with kriyas (think pouring water through your nose or intense breathing exercises), meditate for longer than 5 minutes at a time or practice hours of yoga. Your limbs will ache at times and you’ll have days when your mind questions why you’re putting yourself through it. But your soul, spirit, whatever you call that ‘other’ within you, knows. My motto? You’re there and doing it, so do it well. Rise to the challenge. One of the best things to come out of my trainings, were the relationships I made with my fellow students. There’s something about spending an intense chunk of time together, comforting each other after emotional releasing, seeing each other struggle and come out on top that forms a tight bond I’ve never had elsewhere. All of this work can bring up some serious reactions. For some it means a lot of crying and laughing – and often even some craughing (doing both at once). There’ll be emotional release, frustration and elation and days when you can’t even stand the sight of your mat. You might be confronted by memories you hadn’t accessed for years, or emotional trauma from the past. Yoga might look all nice and graceful and peaceful on Instagram but like everything in real life, it can be both dark and light, easy and hard and sometimes just bloody difficult. Because “that yoga teacher training was a complete waste of time” said nobody. Ever. Subscribe and get your free mediation!